Indigo on the Beach is perfectly designed to let the idyllic outside in. We know how reluctant our guests can be to leave the beach even to come and eat so our open-sided room and terrace with wooden floors allows them to combine the best of both. Stroll in whenever you feel like a snack or a much-needed chilled drink, bare-feet are fine with us or alternatively get dressed up and come for dinner. Indigo on the Beach offers that flexibility and variety that is just what you will want. The freshness of our ingredients are the key to healthy, simple cooking and of course we never forget the little ones – they have their very own menu! 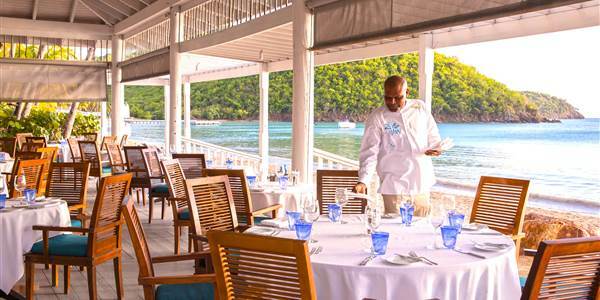 Serving seafood, salads, freshly baked breads and satisfying pasta dishes you will leave ready for more beach-time.